A Interim Group Management Report 5 Executive Summary 12 Property-Casualty Insurance Operations 22 Life/Health Insurance Operations 28 Asset Management 32 Corporate and Other 35 Outlook 37 Balance Sheet Review 44 Reconciliations Interim Report Third Quarter and First Nine Months of 2014 Allianz Group 43 ­­ ­Allianz  SE bonds1 outstanding as of 30 September 2014 And interest expenses for the first NINE months of 2014 1. Senior bonds2 4.0 % bond issued by ­Allianz Finance II B.V., Amsterdam Volume € 1.5 BN Year of issue 2006 Maturity date 11/23/2016 ISIN XS 027 588 026 7 Interest expenses € 46.4 mn 1.375 % bond issued by ­Allianz Finance II B.V., Amsterdam Volume € 0.5 bn Year of issue 2013 Maturity date 3/13/2018 ISIN DE 000 A1H G1J 8 Interest expenses € 5.3 mn 4.75 % bond issued by ­Allianz Finance II B.V., Amsterdam Volume € 1.5 BN Year of issue 2009 Maturity date 7/22/2019 ISIN DE 000 A1A KHB 8 Interest expenses € 55.1 mn 3.5 % bond issued by ­Allianz Finance II B.V., Amsterdam Volume € 1.5 BN Year of issue 2012 Maturity date 2/14/2022 ISIN DE 000 A1G 0RU 9 Interest expenses € 40.4 mn 3.0 % bond issued by ­Allianz Finance II B.V., Amsterdam Volume € 0.75 bn Year of issue 2013 Maturity date 3/13/2028 ISIN DE 000 A1H G1K 6 Interest expenses € 17.7 mn 4.5 % bond issued by ­Allianz Finance II B.V., Amsterdam Volume GBP 0.75 bn Year of issue 2013 Maturity date 3/13/2043 ISIN DE 000 A1H G1L 4 Interest expenses € 32.1 mn Total interest expenses for senior bonds € 197.0 mn 2. Subordinated bonds3 6.5 % bond issued by ­Allianz Finance II B.V., Amsterdam Volume € 1.0 BN Year of issue 2002 Maturity date 1/13/2025 ISIN XS 015 952 750 5 Interest expenses € 49.6 mn 5.75 % bond issued by ­Allianz Finance II B.V., Amsterdam Volume € 2.0 BN Year of issue 2011 Maturity date 7/8/2041 ISIN DE 000 A1G NAH 1 Interest expenses € 87.1 mn 1 For further information on ­Allianz SE debt (issued or guaranteed) as of 30 September 2014, please refer to notes 18 and 19 to the condensed consolidated interim financial statements. 2 Senior bonds provide for early termination rights in case of non-payment of amounts due under the bond (interest and principal) as well as in case of insolvency. 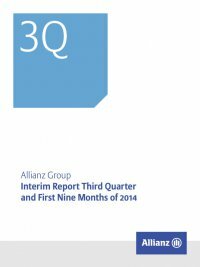 5.625 % bond issued by ­Allianz SE Volume € 1.5 bn Year of issue 2012 Maturity date 10/17/2042 ISIN DE 000 A1R E1Q 3 Interest expenses € 64.5 mn 4.375 % bond issued by ­Allianz Finance II B.V., Amsterdam Volume € 1.4 BN Year of issue 2005 Maturity date Perpetual Bond ISIN XS 021 163 783 9 Interest expenses € 47.5 mn 5.375 % bond issued by ­Allianz Finance II B.V., Amsterdam Volume € 0.8 BN Year of issue 2006 Maturity date Perpetual Bond ISIN DE 000 A0G NPZ 3 Interest expenses € 32.2 mn 5.5 % bond issued by ­Allianz SE Volume USD 1.0 BN Year of issue 2012 Maturity date Perpetual Bond ISIN XS 085 787 250 0 Interest expenses € 32.7 mn 4.75 % bond issued by ­Allianz SE Volume € 1.5 BN Year of issue 2013 Maturity date Perpetual Bond ISIN DE 000 A1Y CQ2 9 Interest expenses € 53.8 mn 3.25 % bond issued by ­Allianz SE Volume CHF 0.5 bn Year of issue 2014 Maturity date perpetual bond ISIN CH 023 483 337 1 Interest expenses € 9.1 mn 3.375 % bond issued by ­Allianz SE Volume € 1.5 bn Year of issue 2014 Maturity date Perpetual Bond ISIN DE 000 A13 R7Z 7 Interest expenses € 1.8 mn Total interest expenses for subordinated bonds € 378.3 mn 3. Issues redeemed in 2014 5.5 % bond issued by ­Allianz SE Volume € 1.5 BN Year of issue 2004 Maturity date Perpetual Bond ISIN XS 018 716 232 5 Interest expenses € 3.2 mn Sum of interest expenses1 € 578.5 mn Interest expenses from external debt not presented in the table € 44.5 mn Total interest expenses from external debt € 623.0 mn 3 The terms of the subordinated bonds do not explicitly provide for early termination rights in favor of the bondholder. Interest payments are subject to certain conditions which are linked, inter alia, to our net income, and may have to be deferred. Nevertheless, the terms of the relevant bonds provide for alternative settlement mechanisms which allow us to avoid an interest deferral using cash raised from the issuance of specific newly issued instruments.